Until April 26th, 1927 there were in Chile parallel, similar police forces. They had to respond to different authorities. This situation did not allow them to fulfil their mission. The first one is stated by the merging -from 1927 to 1932- which we mentioned previously. Since then, Carabineros starts to be separated from the Army from which it inherited its military status and disciplinary principles. In the last mentioned year, starts to be headed by Generals taken from the newly funded Institution. In this period, the emerged Institution is organized to face urgent demands for security. At this time, Carabineros attains its own entity and it is organized in squadrons, groups, regiments and corps. These are distributed along the country according to the political-administrative division of that time. The second period goes from 1932 to 1974. This time is marked by the consolidation of Carabineros de Chile as an Institution. Its work efficiency makes it worthy of prestige which is recognized by the Chilean society. The third period (1975-1979) is stated by the fact that our Institution experiments processes that affect its historical evolution and becomes an important integrating element of the Chilean society to which is devoted and to which it belongs. Finally, the fourth period reaches its reference milestone in 1980 when Carabineros de Chile and its mission are integrated into the Political Constitution of the Republic of Chile (approved in the same year). Its status as Public Security Police Force is definitely established. Its objectives, functions and structure are stated in the Constitutional Organic Law. Carabineros performs its duties all along the national territory; its Capital City, towns, villages and frontiers. Chile is a democratic Republic, its state is unitary. Its territory is divided into Regions with a functional decentralized administration. Carabineros de Chile is present in the whole country; its organizational structure is adapted to Chile’s political-administrative system. Currently, the Institution depends on Chile’s Ministry of National Defense. For operational matters concerning public order and security it coordinates with Chile’s Ministry of Interior. The Political Constitution of the Republic of Chile provides that: Carabineros de Chile is an Order and Security Force whose mission is to enforce the law, guarantee the public order and security, as determined in its Constitutional Organic Law. Likewise, the Armed Forces and Carabineros, as armed corps, are essentially obedient, non-deliberant, professional, hierarchical and disciplined. It comprises those actions performed by the Institution to be inserted in the Chilean society, such as protecting people’s lives and their property, creating a peaceful environment, and maintaining a social balance to enable the normal development of the nation. 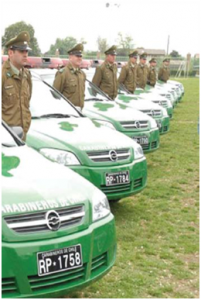 This Preventive Duty constitutes the main and major task which identifies Carabineros de Chile as a preventive Police Force. It refers to those actions performed by Carabineros de Chile for stabilizing the public order when it is broken. It implies to carry out the instructions and directions issued by Chilean judicial and administrative authorities. It deals with those actions performed by Carabineros for the community in order to form the proper attitude and respect for the law. It includes those actions aimed at collaborating and providing useful information of general interest. 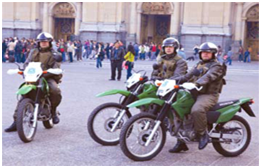 It involves those actions performed by Carabineros to benefit the Chilean society. These actions are very much appreciated, especially in emergency situations and in the satisfaction of people’s needs. These actions are performed by Carabineros in those geographical places where Carabineros should guarantee national sovereignty. Those actions are taken to provide the Courts of Justice and the Public Ministry of the Interior with collaboration and assistance by carrying out investigative procedures, writing reports and scientific expert’s reports to clarify punishable facts. Protection of the President of the Republic, former Presidents and Heads of foreign states when officially visiting Chile. Due to all the above mentioned, Carabineros has also been a forerunner of great advances. In 1962, it was a pioneer at integrating women in policing duties. In 1963, it was the first institution in Chile to organize childhood protection at a nation level. Carabineros’ member’s devotion has been proved in innumerable occasions in the line of duty while performing its daily work. Currently, Carabineros de Chile has 1.139 martyrs who died in the line of duty. They have an important memorial monument located in the most important Avenue of the Capital City. Every agency is under the command of a General rankofficer. Every institutional agency is under a command who belongs to a Colonel rank-officer or a Commanding Officer of Lieutenant Colonel rank. Police Stations, Groups, Sub-Police Stations, or any institutional premises whose command is exercised by a Major or Captain rank-officer. These are Police Units in charge of a Lieutenant Officer. Second Lieutenant, Lieutenant, Captain, Major, Lieutenant Colonel, Colonel, General, General Inspector, General Director. Carabinero, Corporal Second Class, Corporal First Class, Sergeant Second Class, Sergeant First Class, Warrant Officer, Chief Warrant Officer. The Carabineros de Chile’s Academic Programme emerges as a requirement in order to count on highly qualified and trained human resources who have professional and technical skills, as well as doctrine, thus enabling them to meet the requirements demanded by society. It has as a goal to train officers and non-commissioned officers to become highly skilled and specialized in Public Security. Police Officers have to be responsible professionals with the ability to make decisions and provide innovative strategies to prevent criminal actions. Permanent training based on competences. Action research applied to Carabineros’duty. The Constitution of the Republic of Chile, the Carabineros Organic Law, and the Constitutional Organic Learning Law, (LOCE), authorize Carabineros de Chile to implement education projects, to grant degrees at technical and professional levels. It is designed for training in human resources; it is aimed at improving Carabineros’ skills and at developing competences in different fields of knowledge in order to show a permanent and high quality education. Formation Centre: The formation period for officers lasts four years. Upon finishing the third year, the officer-candidate is promoted as Carabineros Second-Lieutenant. During the fourth year, the officer-candidates are ready to start their professional practicum and write their thesis. They are assigned to a Police Station being and are supervised by officers from the Escuela de Carabineros. Those who approve the Order and Security Course are granted the professional degree of “Public Security Administrator”. Those who approve the Course of Public Finance Administration are granted the degree of “Public Accounting Administrator”. The Carabineros de Chile Police Sciences Academy reinforces skills and competencies appropriate for Commanding Officers at the Major rank. After the Officer passes all the subject matters, he/she can obtain the Degree of “Licentiate in Police Sciences”. Improvement Centres: The first to the third levels are supervised by the Escuela de Carabineros, the fourth and the fifth levels are supervised by the Carabineros Police Sciences Academy. Specializations: Instructor Trainer Courses; Helicopter and Aircraft Pilot; Police Intelligence; Special Weapons and Tactics Police Operations; Drug and Narcotics; Criminology; Mounted Police Instructor; Traffic Accidents Investigator. There are 11 police training schools along the country, the main one -Carabineros Police Training School- is located in the Capital City. Four improvement levels, the two first ones are supervised by the Carabineros Training School, and the other ones are supervised by the Escuela de Suboficiales (Non-commissioned Officers School). At the end of the training, the students are in condition to obtain the degree of “Graduated Warrant Officer”. Later in their career, this course allows them to reach the Chief Warrant Officer rank. Radio mechanic; Aircraft Mechanic; Gunsmith; Order and Security Police Dogs Trainer for Drugs, Explosives Detectors, Missing People searching; Mountain Frontier Services Expert; Road Traffic; Special Police Operations Technician; Drill Master. At the same time the Carabinero can study in Universities, Colleges and Higher Education Establishments. The institution’s International Relations are commanded by the Carabineros Director General through the International Relations Department. Due to the international prestige that Carabineros de Chile has reached along its history, it performs an important cooperation role for foreign police forces, mainly in Latin America, by providing them with professional, operational, and academic assistance. These missions have been carried out in Bolivia, Ecuador, Costa Rica, Colombia, El Salvador, Guatemala, Paraguay, Mexico, and Venezuela. 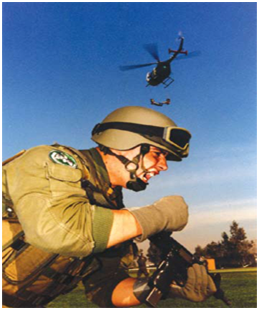 The Chilean government, by means of Carabineros de Chile, implements the Cooperation Programme for Uniformed Foreign Police Forces, CECIPU, which has allowed the training and specializing of more than 1000 police officers and non-commissioned officers, from 30 countries, especially in the American region and from countries like Korea, the Philippines, Lebanon and Jordan. 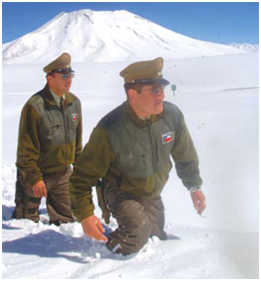 Nowadays about 154 foreign police officers and non-commissioned officers are participating in different academic programmes in Carabineros de Chile centres, 62 Haitians, who are taking their specialization courses for a one-year period, all this under the agreement of the Collaboration Plan of the Chilean Government for that country. The America Police Forces Community, created in 2007. Carabineros de Chile is a founding member. Its members are 19 National Police Forces of the American Continent plus 11 observing institutions: Cuerpo de Policía Nacional de España, Spanish Guardia Civil, the Italian Financing Guard, the German BKA, Europol, OAS, and the Canadian Royal Mounted Police. Currently, the Presidency of the Ameripol is chaired by Carabineros de Chile, represented by the Carabineros Director General.